Moving house and cardboard boxes go together like children and school athletics days. The moment they touch each other groans can be heard throughout the house. Still having done an inter-state move recently and survived the ordeal, I can't help but admire the creativity of this young chap, and his ability to see a pile of similar such boxes, as more than meets the eye. 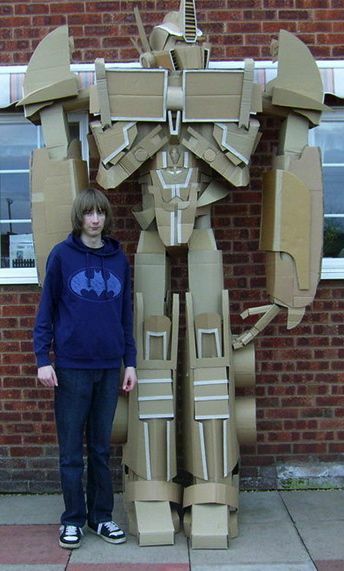 Sure the kid would've needed a few energon cubes of his own to turn this 10ft mix of cardboard, glue and tape, but had the results not been this awesome, he could've been sued by the Cool Council for wasted lounge fort creation possibilities. That's what I did with mine and actually where I'm bloging from. What? Because my fort is cardboard doesn't mean it can't have bluetooth functionality too. While I curse myself for not building an exit door, you can check out Paul Warner's environmentally friendly Optimus sculpture and more, right after the jump. That IS an amazing job! It sure is folks- plenty of talent right there that is for sure.